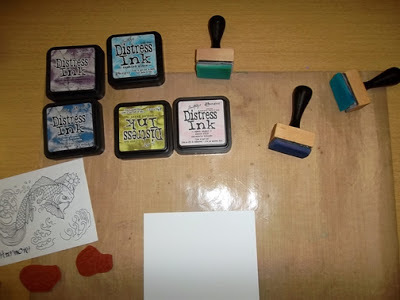 Ramblings of an Impatient Artist: Double the Fun! Happy Friday! This seemed like such a looooong week. I guess because things are starting to get back to normal (whatever that is). I have 2 fun things for you today - Fabulous Freebie Friday and a Bombshell's tutorial - see you thought Christmas was over LOL. The card base is something I came across the other day (I used it again), I really like the size. The print paper is DCWV I've had hanging around for a while. So, you don't have to go out and get something new to work with, although it is fun. I'm sure there's ton of fabulous things you already have that you can use to create something wonderful. Next up is the tutorial. Most of you know I teach a technique tag class and Tim Holtz is probably my favorite inspiration. That said, I thought this technique really lent itself to Koi Tattoo. I've love this set ever since I first saw it and I'm so excited that I decided to use it for this. 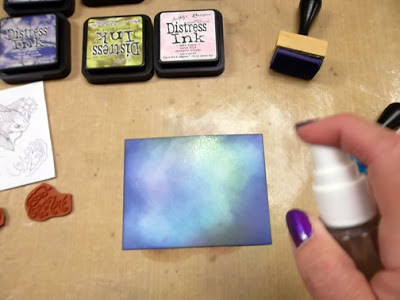 Okay first here's what you'll need: a craft sheet, Distress Inks (various) and I does need to be Distress Inks because other inks don't do this technique as well, cardstock, Foam Blending Tools, a spritz bottle with water, Picket Fence Distress Stain and a stamp. Using the foam blender and various distress colors, blend them on a piece of light colored cardstock. 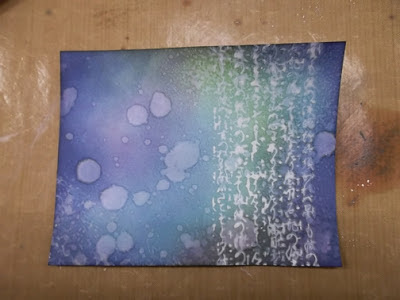 Start your blending on the craft sheet in a circular motion and move in toward the cardstock, this will help to keep from having the "hard"edge of the blending foam from showing up. 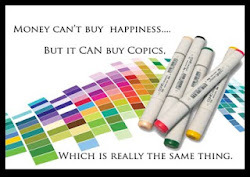 Add color until you're happy with it. 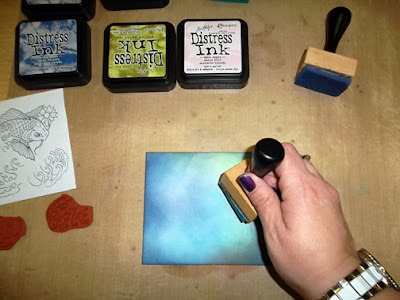 Now take your spritz bottle with water and spray it in your hand and fling it, spritz it directly on the paper or however you want to to get various water spots on the blended inks. If you want you can speed up the drying time by using a heat tool. Now for our last bit, shake up the Picket Fence Distress Stain really good and wipe it all over your stamp. 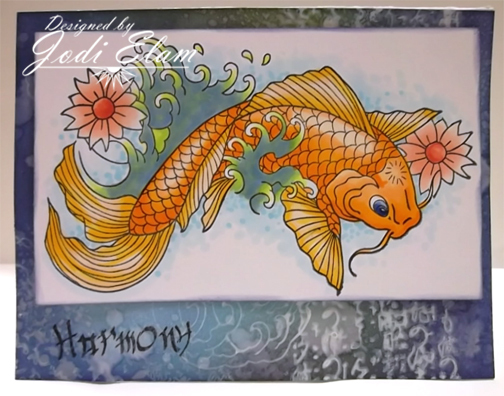 (I used an oriental stamp and the waves from the Koi Tattoo set.) When you have it covered well, stamp in onto your background but don't press down hard, use very little pressure. 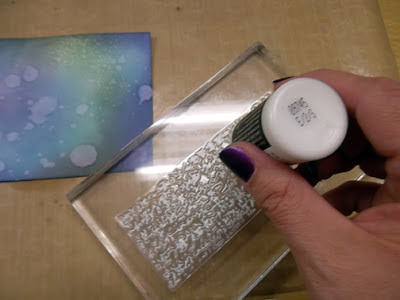 To keep is more white, use the heat gun as soon as you stamp it, if you want it more faded, let it dry naturally. 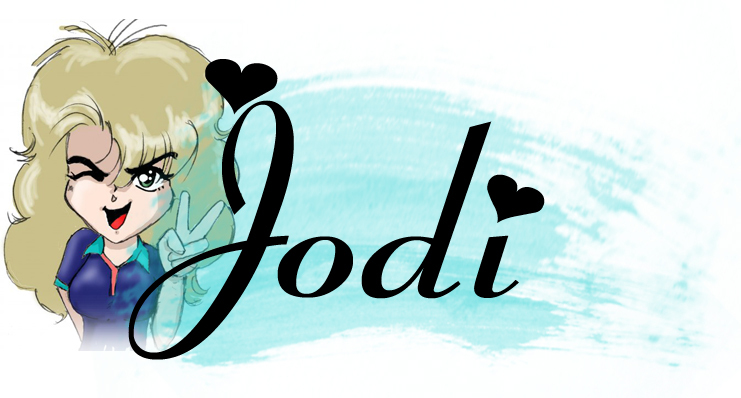 Tada, you have your background! You can blur the white or fade it more using water as well. Remember though, this works best with Distress Inks and Stains. P.S. Don't forget about the Kenny K digi giveaway! 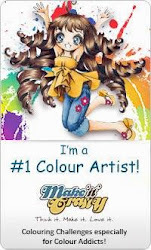 Leave me a comment and you'll be entered to win 3 digi stamps from Kenny K - you have until 11:59 Saturday, Jan. 12. Jodi, great card...I love your coloring! Jodi, I definitely like that card design. Love the background paper you created. Thanks for the tutorial. Two gorgeous creations, Jodi! Love your coloring! Great tutorial! Gorgeous Cards and Excellent Tutorial too.